I was not so sure about this current arc, doubting it, thinking it a retread of the woodbury prison siege, an echo of the high point of this great comic. Then issue 83 happened, and this current arc stands alongside that prison massacre as the pinnacle of this gripping, human drama. 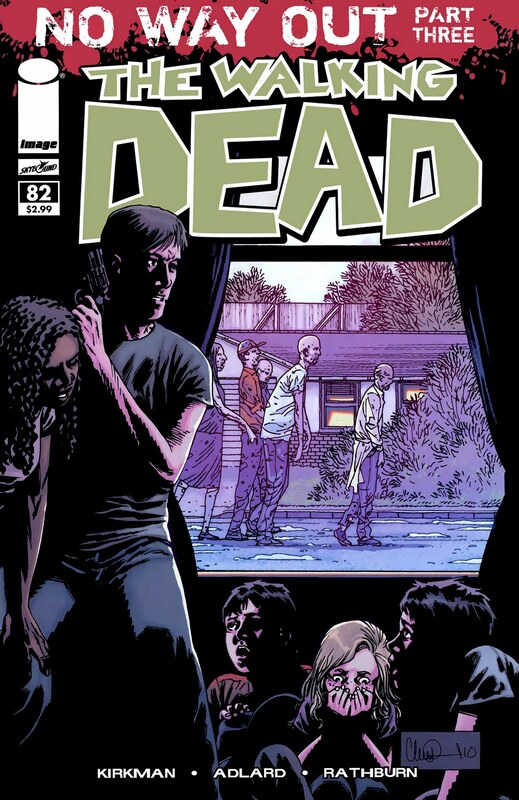 Providing, that is, that Kirkman doesn’t screw it up in the final chapter ( issue 84 ). There is potential for that, as the final shocking pages are not definitive events, there is the possibility that one central character, who is surely near death, could be saved. But that would spoil what Kirkman has achieved in this issue, in a way that I think would tarnish the series and damage it’s reputation as a no holds barred portrayal of the end of days. There is a real sense of panic, confusion and terror throughout this issue, as Rick formulates a plan (based on earlier adventures with Glenn) to get his small group out of the besieged community. This is powerful, raw storytelling, where the hard-earned experiences of Rick, Carl and Michonne are in stark contrast to the way those in the walled community handle this terrifying reality. There are some panels in these pages that literally made me gasp, Kirkman and Adlard pulling no punches. A lot of people die in this issue. While the situation of Rick and his group takes precedence, there are brief interludes where the fate of some of the other cast is far from resolved. 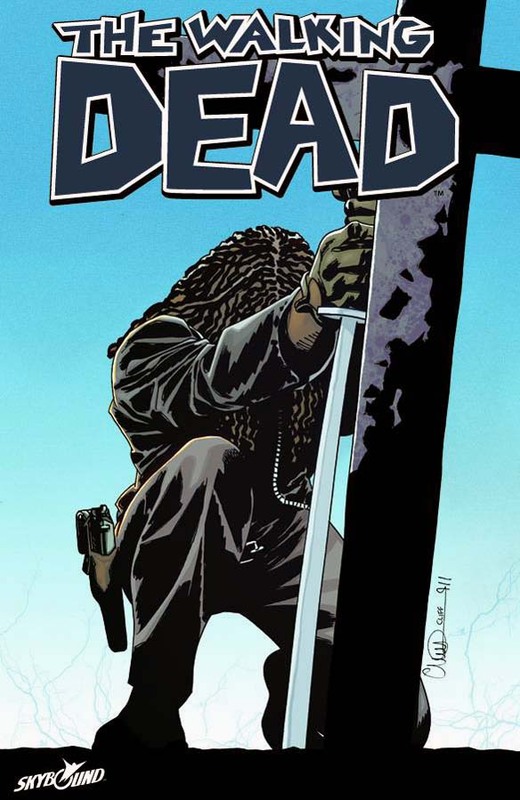 Indeed, no-one is safe, the ghastly rolling waves of undead, insistent and single minded in their objective, make this arc the one where Kirkman delivers an epic zombie tale, as opposed to an epic human drama. This arc is truly all about the dead, and death, and dying. It is shocking, moving and absolutely brilliant. One of the five best issues of the series. If the finale of No Way Out delivers the way issue 83 has, then the series has truly been altered in a way unimaginable a few months ago. This issue does not muck around, picking up seamlessly from issue 81’s high drama. As Rick and Michonne desperately try to save Morgan, elsewhere the chaos and terror deepen. Glenn has accepted his fate, Douglas is a broken man, Abraham is a man with fear and rage surging through him, teetering on the edge of oblivion. Rick and Andrea, divided by a gulf of the undead and a broken haven, are united by one thought – keep those you trust and can depend on closest. Anyone else is expendable. Whereas Andrea shows loyalty to those who she has been with from the start, it is Ricks absolute bloody-minded determination to keep those closest to him alive that is seen to be more brutal and further evidence of his descent into something of an anti-hero. He is not likeable. He does what he needs to do but he is not a saviour, much less a hero. Great issue. Undecided on the arc as a whole, but its looking to be the best since the ‘No-one is Safe’/Woodbury arc. Less reliance on verbosity and the soap opera style conversations that have threatened to derail the pace of the story in recent issues, this is Walking Dead at its best – emotional, violent, frightening. Life is cheap and the end, for some, is near. Follow that link (above) and you will get several pages of the new issue, due to ship today / tomorrow. From the looks of it, it is all-out action as Rick and Michonne fight to save the stricken Morgan. Looking good….